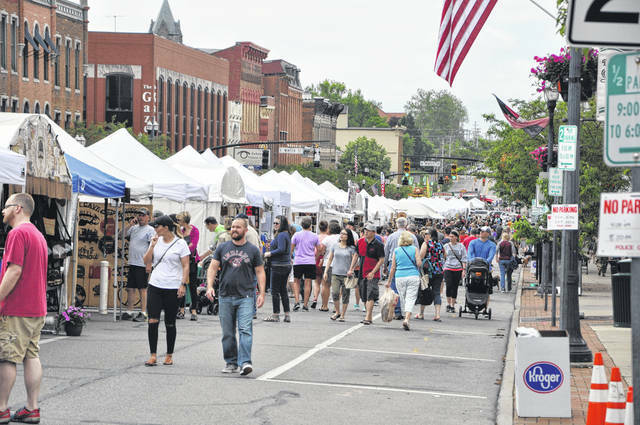 Sandusky Street in downtown Delaware was packed with vendors and festivalgoers on day two of the 45th annual Delaware Arts Festival on May 20. The 45th annual Delaware Arts Festival crossed the finish line with a successful two-day run. “Everyone did well this year, along with good weather,” said Judy Burdette, festival committee vice president. Delaware Kiwanis Club volunteer Sharon O’Neal said the new South Sandusky Street location was profitable for the club. The tables and chairs were really appreciated, she said, because people could sit down, enjoy a bite to eat, and visit with each other. Police Capt. Robert Penrod, checking with South Sandusky Street businesses, heard nothing but positive comments. Entertainment, located on the city plaza, was enjoyed equally by festival guests and performers. Some of the performers are looking forward to coming back next year, said Sherry Riviera, entertainment chairwoman. The Capital City Bagpipe Band started Sunday’s festivities by marching up North Sandusky Street. “The band brought a sense of excitement and enthusiasm to the festival,” Riviera said. Visitors and exhibitors asked if the band would return next year, she added. Two Delaware County high school art teachers, Shannon Mitchell and Nadene Heckelman, judged the 170 exhibitors for best of show, first, second, third and honorable mention winners. Ribbons and cash prizes were awarded to the winning artists. The Best of Show award recipient was Christian Ottaway Pottery, a first-time exhibitor from Columbus. All of Ottaway’s pottery is hand turned and his glazes are all custom mixed. Receiving first place was Tabatha Hemmerling of Hilliard. Hemmerling, originally from Peru, designs jewelry made from Tagua nuts, Acai seeds and other Amazon rainforest products. “The whole concept of the business is to make jewelry out of indigenous products,” said Hemmerling’s husband Martin Pena. As fifth-year exhibitors, he said they enjoy coming to Delaware, because people always take the time to listen. Second place went to Annadele Alpacas from Union City, Pennsylvania.Wearable alpaca clothing is created by a three-artist co-op. Juliann Fausel, a partner, said each artist is skilled. One partner works with felt fabric; another weaves, sews and knits. Fausel said she weaves and sews. The wool comes from 30 alpacas raised on their Pennsylvania farm. The third-place winner was Melissa O’Brien Designs. The Cleveland silversmith is a 1998 Ohio Wesleyan graduate, who designs and creates sterling silver jewelry. O’Brien said she enjoys the Delaware Art Festival because it’s a great show and good people. Honorable Mention for 2018 was Evan Case of Rough Cut Wood Worx of Delaware. Case said, as a young boy, he woodworked on his father’s farm. Later he tried welding. “I started welding to expand what I could do,” Case said. Eventually, his goal is making furniture full time. A first-year exhibitor, it all worked out, he said. The Arts Festival Committee isn’t resting on its laurels. Improvement plans for the May 18-19, 2019 festival are under way. Changes include rearranging South Sandusky Street so it’s more efficient, and a new layout for Winter Street. At the festival committee’s wrap up meeting, Mark Hardymon, festival general manager and photographer, said the City of Delaware and all of its departments deserve a big thanks for their cooperation and help, making the festival weekend fun and safe.